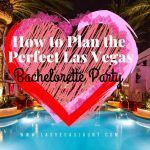 Where else can you plan an amazing bachelorette party than Las Vegas? From extravagant restaurants to exciting shows, you and your girl group are sure to have a blast. Check out how to plan your party accordingly!